Using ordinary chain bind off, bind off 5 sts. Knit remaining 11 sts. Turn work. Bind off 5 sts. Knit remaining 6 sts. Turn work. Purl 6 sts. Turn work. Bind off remaining 6 stitches. Shoulder bind off completed. In real life, these directions are going to get you the fabric illustrated below, with the bind off shown in DARK GREEN. As you can see, this method of bind off creates "stair steps" at the top of the shoulder. When you come to connect the shoulders to one another at the sweater top, this jagged fabric is difficult to sew up nicely. How about if we use short rows instead? Instead of that jagged edge, we'll make a lovely smooth shoulder top--a top which will be a pleasure to sew up when the time comes. The particular kind of short rows we are going to use for the shoulders are a mash up of ordinary wrap-and-turn short rows and Japanese short rows--we'll steal the wrapping and turning from the former and the slip stitching from the latter. Step 1. 16 sts on needle. Knit to within 5 sts of outer edge of shoulder. You will now have 5 sts on your left needle and 11 on your right. Step 2. slip the stitch on the tip of the left needle (shown in PURPLE below) onto right needle. (Slip this and all other slipped stitches "purlwise," which means slip the stitch from one needle to the other without changing the stitch mount--the RIGHT arm of the stitch should remain the forward arm.) Draw running yarn forward, slip purple st back onto left needle, draw running yarn to back again. The running yarn has been turned into a "wrap" around the purple stitch. The wrap is shown in RED, below. Continuing to hold the running yarn in the back, slip the st on the tip of the right needle (shown in ORANGE, below) to the tip of the left needle. You now have 6 sts on the left needle, and 10 sts on the right needle, as shown below. Here is a closeup of the wrap and slip detail. Turn work, purl the remaining 10 sts. Turn work again and knit 6 sts. Repeat step 2, except that when you finish wrapping the purple st and slipping the orange stitch, this time, you will have 11 sts on the left needle and 5 on the right. Turn work and purl these 5 stitches. You will now have all 16 sts on one needle and you'll end up on the neck edge of the shoulder. You will now knit across the entire shoulder top from neck edge to outside edge, all 16 sts, as shown by the DARK GREEN stitches below. As you come to each wrap, fish around with your needles and "unwrap" the red wrap from around the neck of the purple stitch, placing the wrap on the tip of the left needle. Then, k2tog the red wrap together with the purple st. 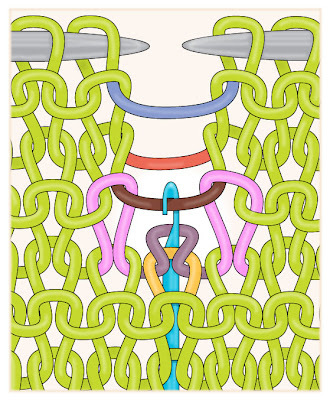 The TURQUOISE stitches along the top row in the below illustration show where these two were knit together. In real life, these directions would get you the fabric below. 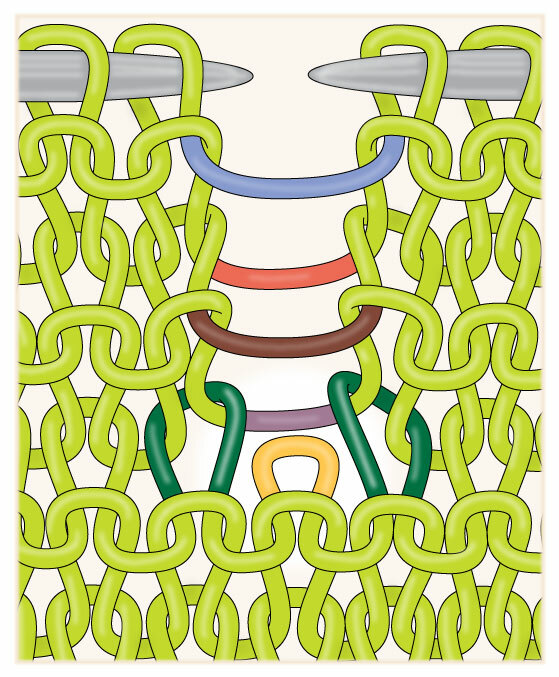 If you compare the final row (DARK GREEN) to the bind off in the first illustration above, you can see that the short row method yields a single smooth descent along the shoulder line: the jagged steps have been eliminated. You can now attach this shoulder to its mate by a three needle bind off, or you could bind it off via ordinary chain bind off on the next row, then sew the shoulders shut. PS: Geek note: If you intend to bind off anyway, you could just as well bind off the DARK GREEN stitches the last row. In other words, that last row could have been worked as an ordinary chain bind off as it was made, instead of working this row and then working the bind off on the following row. Garter stitch and seed stitch don't look much alike. Yet if you go up a column in either fabric, you'll discover that column-wise, both have the same identical structure: a stack of alternating knits and purls. Row-wise, the fabrics differ--in garter stitch, every stitch along a row is the same, while in seed stitch, the rows alternate just like the columns: alternating knits and purls. The upshot of this is that, although we have to establish the foundation stitch of any run-out column opposite-wise in each fabric, yet once we get started, we can fix single-column runs in each fabric by the exact same method, since column-wise they are identical. a loop waiting to be worked is neither a purl nor a knit. A loop sitting at the bottom of a run-out ladder shares this characteristic. It is neither a knit nor a purl...yet! It is not until we draw the next ladder rung through that bottom loop that the loop becomes transformed into a knit or a purl stitch. The consequence of all this is as follows. The first step for correcting a run in garter stitch or in seed stitch is examine the two stitches immediately neighboring the lowest loop of the run out column, in order to determine whether the lowest loop ought to be transformed into a knit or a purl. As this relates to the diagram, you can see that we are working in garter stitch, because in garter stitch, each stitch along any one row is the same as its neighbors. The orange loop sitting forlornly at the bottom of the ladder has two immediate neighbors which are knit stitches (dark green), and this lets us know that it, too, must be transformed into that same kind of stitch--a knit stitch. Slip the stitches on the knitting needles along, transferring them from one needle to another as necessary until the run is between the needles, as shown in the diagram. 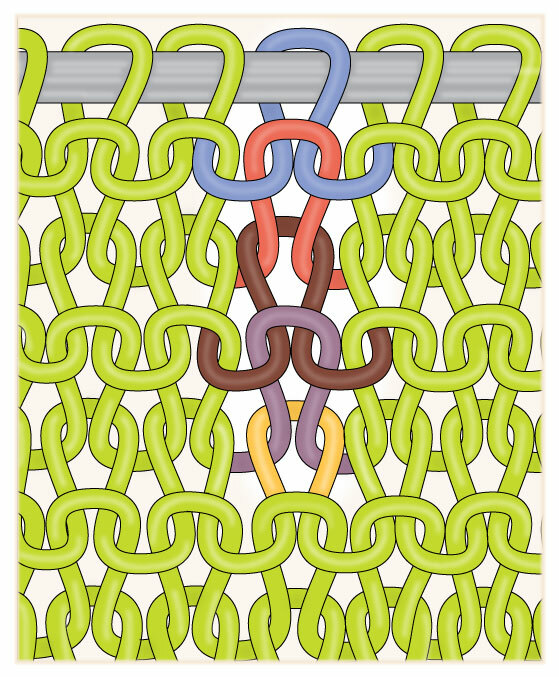 To transform a loop into a knit stitch, hold a crochet hook on the FRONT of the fabric. Insert the hook into the lowest loop (orange) from front to back, as shown. Next, reach up and hook the next rung of the ladder (purple). Draw the purple rung through the orange loop. Given the direction of insertion, the act of drawing through the purple ladder will pop the head of the orange loop to the back of the fabric, leaving the arms aligned on the front in a sort of a little "v." In this way, you have transformed the bottom loop of the ladder into a knit. At the same time, the rung doing the transforming--the purple rung which was drawn through--becomes the loop at the bottom of the run, waiting in its turn to be transformed from a loop to a stitch. 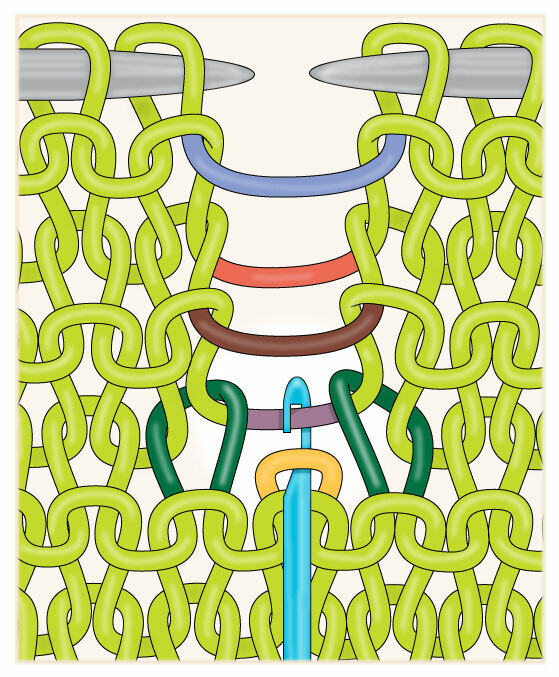 In our garter stitch diagram, we started with an orange loop which had to be worked as a knit. As stated previously, garter and seed stitch runs are corrected by creating an alternating stack of knit and purl stitches. Therefore, we know that the next loop after a knit stitch has to be transformed into a purl stitch. So, the next step is to draw through the following rung (brown) in the opposite direction--to work it from back to front, thus transforming the purple loop into a purl. We can double-check that this is correct because in a garter stitch fabric, the bottom loop is to be transformed into the same sort of stitch as its two immediate neighbors, and these stitches (now colored pink) are both purls--their heads are popped to the front of the fabric. 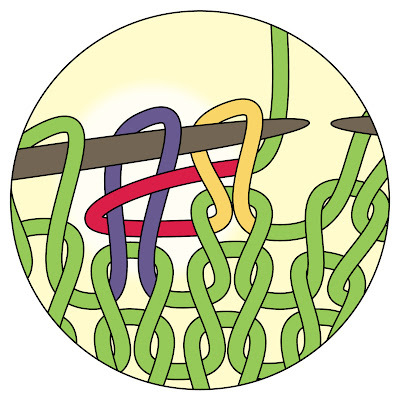 Therefore, the brown rung must be drawn through the purple loop in such a manner as to transform the purple loop into a purl stitch. Specifically, whenever you need to work a loop at the bottom of a ladder as a purl, here's how: Insert the crochet hook from the back of the fabric, through the purple loop, from back to front, as shown. Then, draw through the next ladder loop (brown), working from back to front. Keep repeating this process, moving the crochet hook to opposite faces of the fabric and drawing the next ladder rung through the loop below. To get the crochet hook to the other side of the fabric, you've actually got to remove it from the loop you just drew up, pinch that loop with your fingers, put the hook on the other side of the fabric, and insert the hook into the loop you are pinching. 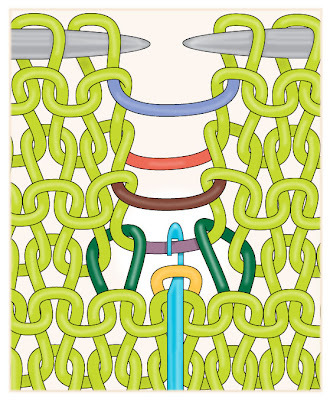 Once you have drawn up each new loop to alternate faces of the knit fabric, you will have created a column composed of a stack of alternating knits and purls, as shown in the last diagram, below. I have illustrated the process in the conceptually simplest manner, showing the work as if it were always to be seen from the same side of the fabric. This is fine for a dropped stitch or two, and this orientation makes it easy to understand, I think. However, here are two shortcuts which make this process easier to work if you should happen to have more than a stitch or two to fix. Once you have gone through the pinching-neede-switching-and-inserting process two or three times, you will see that it really annoying to have to insert the crochet hook from the back. Luckily, as we all know, the opposite of a purl is a knit. Therefore, when it appears from the front of the fabric that the next stitch ought to be a purl, you will find that it is much easier to flip the fabric around front-to-back instead, so that you are always inserting the crochet hook into the bottom loop from the front, thus transforming the loop into a knit stitch. The back of the knit is a purl, so all is well. After you have worked a few runs as for shortcut 1, you will discover that even though flipping so that you can always insert from the front is easier than trying to insert from the back, it is still quite annoying to have to continuously remove the crochet hook, only to have to insert it again once the fabric has been flipped. It is at this point that you might wish to consider buying a double-ended crochet hook or a special kind of double-ended latch hook tool called a "seed-stitcher." With a double-ended hook, you can do all the latching-up from the front. This is done by sliding the needle from one end to the other, using opposite hooks alternately, for each stitch to be made. Although this sounds very complicated, it isn't--once you get hold of a double ended hook you will see how much easier this is. Here is a link to a video showing how to use a certain kind of double ended crochet hook called a "fix-a-stitch" and here is another link to a you-tube video by the makers of the "seed-stitcher" double ended latch hook tool, also showing how to do this. 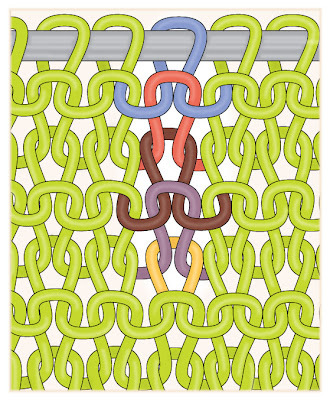 The second video shows machine knitting being latched up, but the same technique is used for hand knitting. At 24 seconds, you can see the seed stitcher being pushed through to its other end to make a purl stitch after a knit stitch, at 35 seconds, you can see the seed stitcher being pulled forward to make a knit stitch after a purl stitch. Both the double-ended crochet hook and the double-ended latch hook work in the same manner, although you might find the latch hook easier to use. PS: Special thanks to Joan Schrouder who first clued me in to the seed stitcher tool.